Arsenal’s mid August crisis seems so far away at this stage. At that time they had just lost their opening game of the new season at home to Aston Villa and Gunners’ fans were disappointed at Wenger’s typical Scrooge like dealings in the transfer market. Then Mesut Ozil signed on the dotted line and all has gone swimmingly for Arsenal since then. Following their comprehensive 2-0 win over Liverpool on Saturday evening, Arsenal now sits 5 points clear of the chasers at the top of the Premier League. Their critics would say that they have faced an easy set of fixtures so far; and they would have a valid point. The current average league position of the teams that Arsenal has faced has been 13th, which compares with the average position of 10th for Chelsea’s opponents. Still, Arsenal can only beat the opponents they face on each match day, and in they have done that 8 times since their surprise upset to Aston Villa. Their only less than perfect league result has been away to West Brom at the start of last month. I’m keen to get a look at what the shots in Arsenal’s games can tell us about how they have performed and whether their league leading position after 10 games is justified. Although it’s been Arsenal’s attacking talent such as Ozil, Giroud, Cazorla and Ramsey that has received most of the plaudits I’ve been seriously impressed by the Arsenal defensive performance. Arsenal has conceded 9 goals this season, but the two penalties scored by Sunderland and Aston Villa are not included in the above chart. 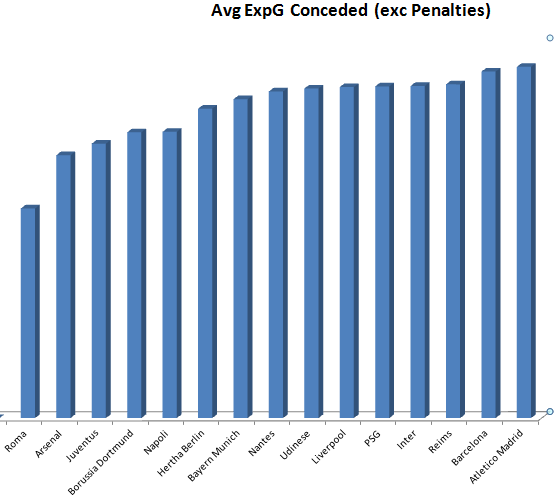 The concession of 125 shots is not elite; in fact the average EPL team has conceded 129 shots. However, what Arsenal has done superbly is limit the amount of dangerous shots that they give up. Their concession of just 31 shots (3 per game) from the Prime Zone is the best in the league; Tottenham, Man City and Everton are next best in this measure with 35 shots. The result of preventing shots from good locations is that the average goal probability per shot allowed by Arsenal (at less than 7%) is the lowest in the Premier League. I posted the following image in this look (link) at Roma, but it’s worth publishing here even if the figures do not take the latest round of games into account. Out of the 98 teams in the Big 5 leagues, only one team, Roma, forced teams to take shots where their average goal probability per shot was less than that allowed by Arsenal. That metric must bring tremendous satisfaction to the team and their coaching staff. I am measuring the average goal probability by using the ExpG measure created by Constantinos Chappas and me. Some outline details about ExpG can be found in this article, but as we use this metric for betting purposes we’d prefer not to reveal the full details of the calculation method. 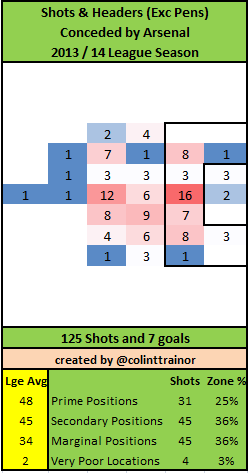 Incidentally an approach similar to this ExpG model seems to be used by Prozone and Joey Barton recently published some of Prozone’s stats on QPR here. At least we seem to be in good company……. As well as owning the best average ExpG value allowed per shot, Arsenal have the lowest aggregate ExpG value conceded in the league. This suggess that the Gunners are defensively sound and means that, on the whole, Arsenal’s low goals conceded total of 7 (excluding those 2 penalties) is deserved. Although there are four teams that have conceded fewer league goals than Arsenal I would contend that the Goals Against column for those teams (Chelsea, Spurs, West Ham and Southampton) are much better than the shots they have given up would suggest. The most extreme example of this is Southampton where they have conceded just 4 league goals. 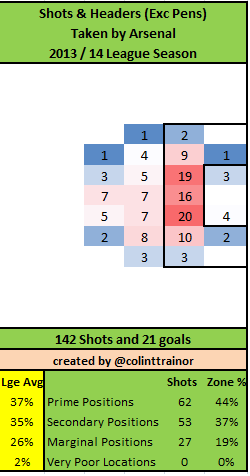 Using the ExpG value for every shot conceded I ran a simulation which replicated the 97 shots that Southampton has faced this season 10,000 times. In only 2.03% of these simulations did Southampton concede 4 goals or less. Perhaps Southampton are doing something different where the probability of a team scoring against them is less than the average team in our data set but I don’t think so. This incredibly low probability suggests that the Southampton goals conceded number is going to see some regression in the near future as the variance that they are currently getting the benefit of will turn on the Saints. Who knows? Perhaps Asmir Begovic’s goal for Stoke against the Saints on Saturday is an indicator of the “bad luck” that may be ahead of Southampton. What’s even more impressive about Arsenal’s defensive performance is that they have improved as the season has gone on. In 3 of their opening 4 games Arsenal conceded more than 1.00 ExpG (that is our estimation of the number of goals that a team should score given their shots); and their opposition in these games included Aston Villa, Fulham and Sunderland – none of which could be categorised as strong opposition. However, in each of their last 6 games their ExpG against has been less than 1.00 and they conceded just 4 goals in those 6 games, so it’s not by luck that opposition teams are feeling frustrated after facing Arsenal. I have seen Mathieu Flamini singled out for praise upon his return to Arsenal’s defensive system, and our ExpG numbers would corroborate that fact. It’s probably no coincidence that he missed Arsenal’s opening two games of the season (when Arsenal shipped 2 of their 3 highest defensive ExpG figures). The introduction of the French man has corresponded with a tangible decrease in the chances that Arsenal have given up. Arsenal’s 142 shots represent the fourth highest volume of shots amongst teams. Liverpool has also had 142 shots, and that pair trail behind Trigger Happy Tottenham, Chelsea and Man City in terms of efforts on goal. Arsenal is very careful with their shooting locations, with no shots so far from the Very Poor Locations zone and 44% of their shots come from the Prime Zone which is well above the league average of 37%. That Prime Zone figure of 44% is bettered by just Man City, West Brom and West Ham; with all of those teams have more headers than Arsenal. The significance of this is that a team that has headers making up a larger proportion of their total chances would expect to see those chances originating from closer to goal than shots. The trade off here though is that headers are converted at lower rates than kicked shots from all spots on the pitch. All of the above means that Arsenal, although very good, from an attacking point of view have not been exceptional when analysed through the lens of our objective ExpG measure. Man City, Chelsea and Liverpool (by virtue of their excellent average shot probability) all post aggregate ExpG values in excess of Arsenal’s number. For the record, we have Man City with an ExpG of 8 higher than Arsenal, and Chelsea and Liverpool both at 3 goals higher than Arsenal at this stage of the season. It’ll not surprise anyone when I therefore contend that although Arsenal has been a joy to watch this season they have over-performed in scoring 21 goals from their 142 shots. I processed Arsenal’s 142 shots through my simulator and on just over 10% (10.13%) of the simulations did Arsenal score at least 21 goals from the shots they took on. So, the over achievement of Arsenal in front of goals is not quite as significant as Southampton’s in stopping the goals being scored but, for my money Arsenal’s current goal tally of 21 goals (excluding the Giroud penalty) is somewhat inflated given the shots they have taken. One of the stars of the season so far has been Aaron Ramsey with his 6 Premier League goals. The Welsh midfielder has significantly upped his performances this season, probably due in no small part to the increased confidence that finding the net brings with it. However, Ramsey is a perfect encapsulation of how Arsenal has scored more goals than the shots they have taken would suggest. Using the same simulation methodology as above I have ascertained that Ramsey would score 6 goals less than 1% (0.85%) of the time based on the shots he has taken this season. Even without access to advanced metrics, we know that shots are scored at a rate of approximately 10%. Ramsey’s average shot location is certainly no better than would be expected for the league as a whole. This simple logic would dictate that Ramsey would have been expected to have scored 2.30 goals from his 23 shots, not 6. I want to be clear that our ExpG model uses much more complex inputs than laid out in the preceding paragraph, but even those simple numbers can give a sense of Ramsey’s over achievement in terms of putting the ball in the net. I’m including a plot of all Ramsey’s shots this season and I spent some time trying to think of whose shots I could compare against. I eventually settled on comparing the shots that Ramsey has taken this season with those taken by the same player last season. 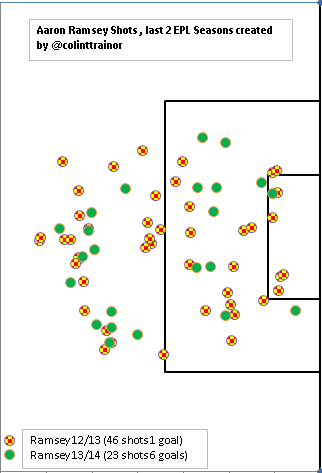 The current season shots are the green dots, with the red and yellow checked dots representing the shots taken by Ramsey last season. 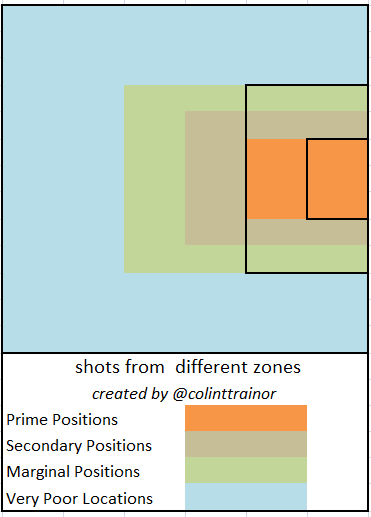 I think it’s fair to say that the general shapes of the shot locations are roughly similar from last season to this. It is therefore surprising to see that last season Ramsey only scored 1 goal from his 46 shots, yet this season he’s shooting the lights out with 6 goals from half as many shots as last season. You’d barely believe that these shots were struck by the same player. I’d suggest that the true Aaron Ramsey conversion rate is somewhere between the two extremes, but the above image is a powerful reminder as to how much variance can exist when analysing individual players’ shots due to the relatively low numbers taken per season. Interestingly, Ramsey’s variance of 6 actual goals against his 2 ExpG actually explains the majority of Arsenal’s attacking over achievement. When we combine our attacking and defensive ExpG values for the entire Premier League, we rank Arsenal in third place overall, behind Man City and Chelsea. Defensively they have been superb ensuring that teams shoot from unattractive locations, but the fact that Arsenal currently tops the league is partly due to variance in my opinion, and unless the Gunners create more and / or better attacking chances I would expect them to come back towards the chasing pack. As a result of Arsenal’s relatively gentle start to the season in terms of opposition faced, it is inevitable that their strength of opposition will toughen up between now and Christmas. In the event that goals start to dry up for the North London club the media will probably latch on to the fact that Arsenal have found it tougher as they face better opposition. In my opinion, this will be misguided as Arsenal is due a goal scoring regression regardless of who they face in their upcoming fixtures. Another way of visualising the “luck” element that Arsenal has benefitted from this season is through PDO. PDO is a concept that has been taken from ice hockey and it is supposed to measure luck by adding together the % of shots that a team scores and the % of opposition shots that they save. In summary, the league average is 100, and a number greater than 100 would suggest that a team has been lucky. Our own Ben Pugsley has been keeping a record of PDO (amongst a host of other stats) over on his Bitter and Blue blog, and he has updated the stats for GW10. His stats tables can be found here. Arsenal tops the PDO table after 10 weeks. Now I’m not totally convinced by the merits of PDO as it has at its core a belief that all shots for and against are equal, and I have shown that Arsenal allow poorer quality shots than anyone else in the league. Still, even with that proviso I think it is useful to show that there is a measure other than our ExpG that shows that as good as Arsenal have been they are perhaps in a little bit of a false position. I think it’s important for Arsenal fans to recognise this; they can certainly bask in the warm glow of being league leaders but be aware that the shooting performances suggest that there are currently one or two better teams in the Premier League than the Gunners.